Goodreads says, "Half-sisters Cassie and Peck could not be more different. Cassie is a newly divorced journalist with her feet firmly planted on the ground; Peck is a vintage-obsessed actress with her head in the clouds. In fact, the only thing they seem to have in common is their inheritance of Fool's House, a rundown cottage left to them by their beloved Aunt Lydia. But Cassie and Peck can't afford the house, and they can't agree on anything, much less what to do with the place. Plus, along with the house, they've inherited an artist-inresidence and self-proclaimed genius named Biggsy who seems to bring suspiciously bad luck wherever he goes. As these two likable sisters try to understand their aunt's puzzling instructions to "seek a thing of utmost value" from within the house, they're both distracted by romantic entanglements with men from their pasts." Two very different half sisters, Peck and Cassie, inherit a cottage at the Hamptons. Cassie, a recently divorced aspiring writer, is set on selling the place, but Peck, a Manhattan actress, loves the glamour of the Hamptons and would rather keep the house, interestingly named Fool's House. It's their Aunt Lydia's house and was a mecca to many a literary lover and artist; in fact, there is still an artist staying at the house, which only complicates things even more. To make matters worse, Lydia's will reports that there is something in the house of the utmost value, but the sisters can't figure out what it could be. Meanwhile, Peck and Cassie have an extremely memorable summer at the Hamptons and even encounter their former flames. Fans of chick lit will want to soak up Danielle Ganek's The Summer We Read Gatsby while on the beach with a cool drink, the sun, and sand. 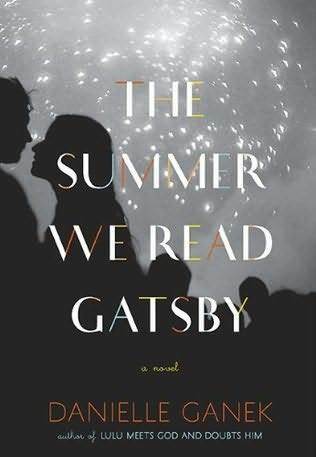 This is the perfect beach read as The Summer We Read Gatsby includes, fashion, parties, mystery, cocktails, summer romance, and the glamourous setting of the Hamptons. I know I would have enjoyed this novel even more if I could have read it on the beach and got lost in their alluring world. Ganek included a ton of Gatsby references, which I loved as it's one of my favorite classic novels. Peck is obsessed with all things vintage and Fitzgerald and turned Cassie onto Gatsby one summer when they were young adults; so, both sisters love it for different reasons. Even if you never read The Great Gatsby before, you can still enjoy this novel. At times, the pace of this book was slow, but I am glad that I stuck with it, because once the girls started to figure out the mystery surrounding the will and the resident artist, I was hooked. But be forewarned, the plot takes its time getting started. This book is perfect if you want to forget about it all and dive head first into a seductive world where summer rules. I've been lucky enough to spend a few summers at the beach and this novel truly captures the carefree feelings a summer house and its inhabitants posses. Cocktails on the porch anyone? Now this really does sound perfect for a long-time Gatsby lover on a lazy summer's day. Thanks! I've never really given this book much thought, but now I'm super curious. It really does sound like the perfect read for a vacation. Thanks for doing this beach read series- it was a great idea!! I am loving your beach read series. The Hamptons makes for a very interesting setting for a glamorous mystery/romance. I may have to check this out. Ohhh fun! The Great Gatsby is one of my favorites, I just love that time period:) You're giving me so many great book ideas Christina, thank you! I hadn't seen or heard of this one. What fun. Excellent review. Ooh, this sounds fun. I love Fitzgerald and dated a boy in college who was from the Hamptons -- so that glimpse into that world is one I am fond of -- it might be fun to revisit!